I have a suggestion for those of you that are going to be using the Takom kit. If you are going to be upgrading to PE tool holders you might want to start looking for a new set of tools also. 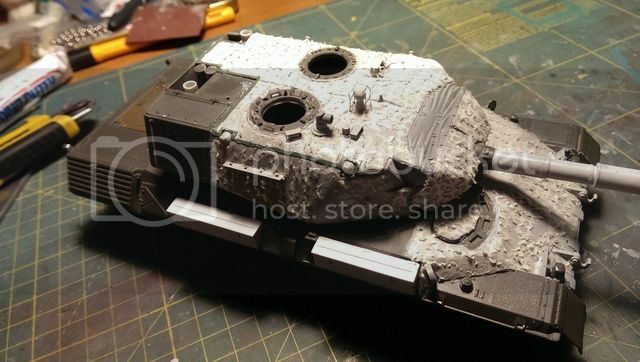 So far the ones in the Takom kit (Leopard C2) look like they were run over with a road roller. So I am using whatever comes to hand. Speaking of that.... does anyone have a source for tools that doesn't involve ripping off another kit? Right now I am cleaning up the bolt cutters from an old Tamiya Leopard I A4 kit. I cant find my self on the campaign list ??? Here is my build for the campaign, a Danish Leopard 1A3 with thermal mattes. These Leopards are quit unique for the Danish Army. Most of the tank was covered in a carpet-like material which would make the thermal image of the tank lesser. These mattes actually worked quit well although they did tend to be a habitat for insects and would make NBC de-contamination of the tank more cumbersome. I’ve got a stash of the old Italerie kits so I’ve decided to use one for the build. Personally, for a build of a welded turret Leopard tank I still prefer these kits. I’ve planned to upgrade with Mengs D640A workable tracks, Eureka Towing Cables for leopard ½, and replacement wheels, towing hooks, rear mud flaps as well as Smoke Launchers from Leopard Workshop. The mates will be a product intended for carpeting dull houses. I haven’t decided on the barrel jet. I like to portrait my build as a tank having its barrel cleaned after a shooting. I therefore have to find a barrel that can be depicted as one without any of screens, and which can show the fume extractor in another position. This is an exciting project and the very best of luck with it. It will be interesting to see how this progresses. Thanks for joining us Kenneth:-) I'm glad you are here. I'd like to enroll this campaing with Leopard AS1. 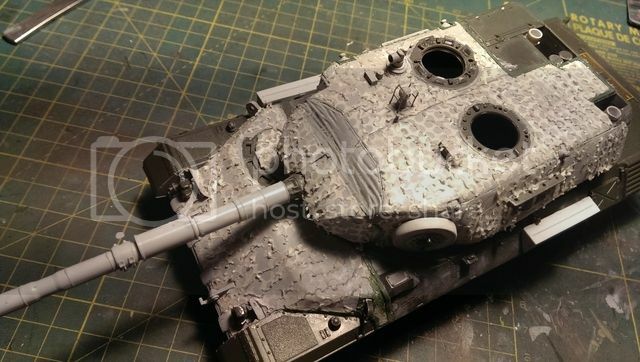 I've just started building this tank using Meng kit as a base for this conversion. In the evening I'll try to post photos showing current statys of this model. Have enlisted but still undecided what to build,Initially a4 Leopard but thinking maybe a Belgian leopard in training before the upgrade.The black recce Leopard is appealing also.Anybody ever build the Black Reccce version? Here are few photos of current stage of my AS1. This is a model I'd like to participate in this campaign. And here is a photos of C2 Mexas I'm trying to finish. Glad to see an AS1 entered. Have you seen the latest Trackpad AS1 book? I’m hoping everyone is ready to begin or have begun limited operations! This Campaign will last 153 days and being a leap year we get an extra whole day.I don’t know about you all but I certainly can use that extra day. With 32 participants this Campaign is shaping up to be a good one. There seems to be a large contingent of Canadian Leopards (myself included) however other nations are well represented. I’m looking forward to seeing everyone on deck in 10 days and even learning a lot of new things. Hi Eric. It is nice to see much enthusiasm. For a long time I've wanted to build a UN Leo 1A5DK, so this is my excuse to get it done!! Though I like the Maple Leaf on a Leopard, mine will have Iron Crosses on the turret. It seems as if Revell's new Leo 1 won't come in time, so I have decided for Tamiya's 1A4 for this campaign. It's the only Leo 1 kit I have in stash at the moment. Unfortunatly I have noticed that this kit doesn't include the towing cables and the snow grousers. What I could do is use Evergreen profiles to get at least the rails. Any other (better) ideas? PS: Right now I still work on 2 Focke-Wulf 190, which I will finish before starting this campaign. That will still take about 3 weeks, I guess. The Revell kit is supposed to be released next month. We'll see. Oh, that's good news (I mean both ... ) We have club meeting tomorrow so I can order the Revell kit right away, because we have our own dealer in the club. But anyway, it would be nice if you could help me out with the rails and grousers, Michael. That's because the Canadian Leopards are the coolest! A close second are the Danish Leopards! 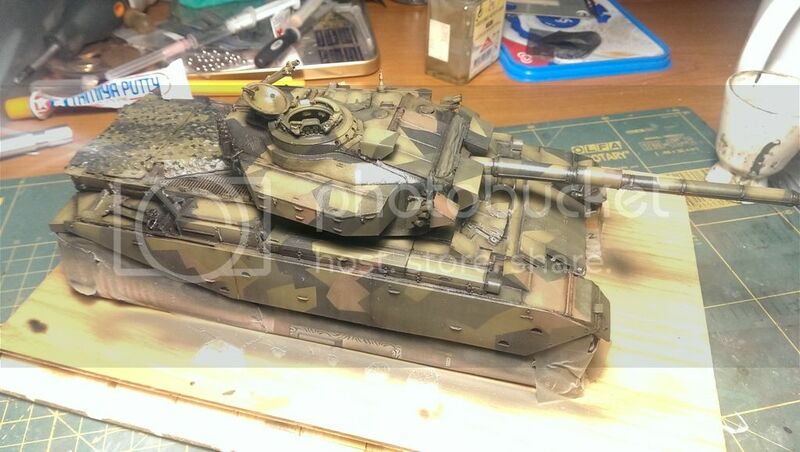 OK. Meanwile I'll try to start weathering my Strv.104. I was considering buying this book. But it's quite pricy. I think I'll rely on photos I found on the web. Personally, I think Norwegian Leo 1s are the coolest, so it would be nice to see someone here build one. Splinter camo rules, OK? Thanks Michael. You've got mail. I just noticed the flags in you banner and am really surprised. Great Britain surely never had the Leopard in their inventory. They had Cents and Chiefs. And what flag is there between Italy and the Netherlands? Is that Lebanon? I wouldn't know .... Are you sure? Or am I mistaken? Lebanon is a little dubious as they had decided to take on 43 ex-Belgian 1A5BEs!! However, I have never seen any reports of their actual delivery or use in Lebanon. Let me know if anyone has any more definite info please. I am not an expert either so I’ll just say that my source is dubious (love that word). I have seen in research that Great Britain had a small number of Leopards as Michael mentioned but have not been able to find any photos of one. As for Lebanon I considered leaving it off but in the end left it on in the off chance someone might put forth a photo of a Lebanese Leopard 1 (that would be kool), but I agree with Michael that they most likely were never delivered…but who knows. …and Torsten that STRV-104 is Beautiful! 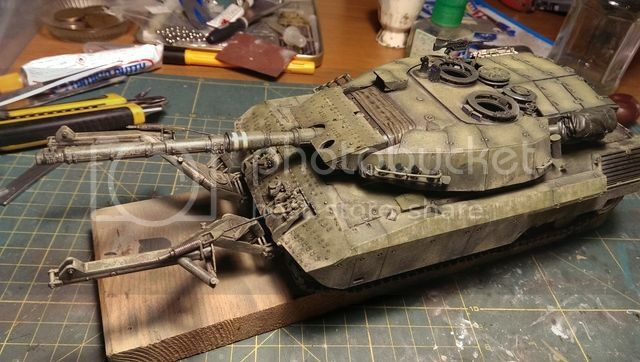 As for the Leopardmania 50 Banner in my signature, I’m done with it and if anyone would like to add it to their signature please send me a PM here on Armorama and I’ll get you set up with it.